Florida Transport is a full door-to-door transportation company that specialise in serving Orlando’s rental villa guests. We have been providing quality service since 1993 and have earned the reputation as one of Orlando’s most reliable ground transportation operators. We have worked with tour operators, villa owners and management agents extensively and we have a comprehensive understanding of your transportation requirements when staying in a holiday villa. We are a one-stop-shop for all of your transportation needs during your stay in the Orlando, Kissimmee, Davenport and Clermont areas. From our all-inclusive Airport Transfer and Car Hire package to our full range of transportation services our aim is to understand your specific requirements and help you choose the service that best works for you and your family so you may have the most memorable holiday! So whether you want a driving holiday or would like to be chauffeured, Florida Transport can help you decide what will work best for you! We can take away the guess work and arrange any or all of your transport needs during your holiday. Any taxi company can provide a ride however, many of the areas in which rental villas are located are away from their usual fares. If your driver is not familiar with the area to which you are travelling, the journey can prove stressful and very expensive. 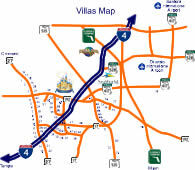 We specialise in serving rental villas and in addition to knowing Orlando as well as any driver should, we have a thorough knowledge of every development on which rental villas are located. This map (which will enlarge when clicked shows all of the villa communities in the area along with the major attractions and the road network. If the image is too small, click on it and an enlarge button will appear in the bottom right hand corner.